No guest this week because we had to re-schedule some stuff, sorry! 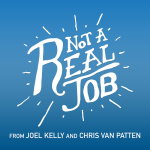 Instead, Chris and Joel talk about business positioning. Why is it important in marketing and yet why is it so undervalued? Joel also loses hope in his own words part way through but things work out. Chris is sick again and Joel is busy setting blogging goals. The two sit down this week to talk about common WordPress mistakes made by small businesses. They also delve into general advice for website building and being honest with your needs. The Family Knife – Market Positioning: Who is your product for? There’s audio issues all around in this episode, but Stephen does a great job smoothing things over with music. Because of the audio problems, everyone’s a little out-of-sorts and not much business talking gets done. We’re breaking new ground here – Joel is recording from his couch rather than his desk. These are exciting times, indeed. Joel and Chris also have a discussion about the value of cost-cutting versus purely trying to increase revenue. While costs can only be decreased, so much and revenue has a near-infinite ceiling of possibility, there’s a lot more evaluation that should be done on whether you really need to be spending as much as you are. Joel wants to do another show-in-a-show. But he’s spent too much energy this week fighting a certain Canadian postal service provider to do that, so let’s talk about management, leadership, and emotions instead!